Gary Jones and Chris O'Grady scored in the final 10 minutes as Rochdale beat Dagenham & Redbridge to go five points clear at the top of League Two. Dale led when Jones' drive was parried away by Tony Roberts but fell to Temitope Obadeyi who swept the ball in. Daggers, without boss John Still due to illness, levelled when Jon Nurse found Josh Scott who slid the ball home. But Jones made it 2-1 with a thumping 25-yard shot and O'Grady sealed the win from close range in injury time. "Up until about 15 minutes from time I thought we were fairly in control. "They're a very good side are Rochdale and have got a system and their front two are dangerous, but I thought we coped with it fairly well in the second half. "But their guy has struck one in from 25-30 yards, it was a great strike but I think we should have come across and defended it a little bit better." 90:00+4:22 The referee signals the end of the game. 90:00+2:27 Assist by Chris Dagnall. 90:00+2:27 GOAL - Chris O'Grady:Rochdale 3 - 1 Dag & Red A goal is scored by Chris O'Grady from close in to the bottom right corner of the goal. Rochdale 3-1 Dag & Red. 90:00+1:33 Free kick awarded for a foul by Chris Dagnall on Abu Ogogo. Danny Green takes the free kick. 90:00+0:53 Shot from outside the penalty box by Andy Haworth goes wide right of the goal. 89:36 The free kick is swung in left-footed by Thomas Kennedy, Abu Ogogo manages to make a clearance. 89:36 Booking Abu Ogogo is booked. 89:26 Unfair challenge on Andy Haworth by Danny Green results in a free kick. 88:51 The ball is crossed by Chris Dagnall. 88:14 Unfair challenge on Chris O'Grady by Mark Arber results in a free kick. Scott Wiseman takes the direct free kick. 86:56 Unfair challenge on Nathan Stanton by Wesley Thomas results in a free kick. Thomas Kennedy takes the free kick. 82:45 Chris O'Grady provided the assist for the goal. 82:45 GOAL - Gary Jones:Rochdale 2 - 1 Dag & Red A goal is scored by Gary Jones from just outside the box to the bottom right corner of the goal. Rochdale 2-1 Dag & Red. 80:51 Effort from the edge of the area by Chris Dagnall goes wide of the right-hand upright. 79:03 Outswinging corner taken right-footed by Danny Green, Mark Arber produces a header from inside the area that goes over the bar. 78:06 Wesley Thomas gives away a free kick for an unfair challenge on Nathan Stanton. Free kick taken by Frank Fielding. 76:52 Tony Roberts takes the free kick. 76:52 Substitution Andy Haworth joins the action as a substitute, replacing Will Atkinson. 76:52 The referee blows for offside. 74:22 Substitution Joao Carlos replaces Jon Nurse. 74:06 Chris O'Grady produces a right-footed shot from deep inside the six-yard box which goes wide of the right-hand post. 72:36 Free kick awarded for an unfair challenge on Mark Arber by Chris O'Grady. Direct free kick taken by Tony Roberts. 71:23 Corner taken by Danny Green. 70:14 Substitution Jason Kennedy joins the action as a substitute, replacing Jason Taylor. 68:47 Chris O'Grady challenges Marlon Pack unfairly and gives away a free kick. Tony Roberts takes the direct free kick. 67:45 Craig Dawson gives away a free kick for an unfair challenge on Josh Scott. Danny Green has a direct shot on goal from the free kick. 64:40 The referee blows for offside. Free kick taken by Tony Roberts. 63:09 Corner taken by Danny Green, save made by Frank Fielding. 62:41 Josh Scott takes a shot. Frank Fielding makes a save. 60:59 Substitution (Dag & Red) makes a substitution, with Wesley Thomas coming on for Graeme Montgomery. 59:35 Frank Fielding takes the free kick. 59:35 Booking The referee cautions Danny Green for unsporting behaviour. 59:13 Free kick awarded for a foul by Danny Green on Thomas Kennedy. 58:19 Effort on goal by Chris Dagnall from just inside the area clears the bar. 56:12 Substitution (Rochdale) makes a substitution, with Kallum Higginbotham coming on for Temitope Obadeyi. 55:06 Peter Gain delivers the ball, save made by Frank Fielding. 54:43 Josh Scott fouled by Scott Wiseman, the ref awards a free kick. Mark Arber restarts play with the free kick. 53:04 Inswinging corner taken right-footed by Danny Green played to the near post, Gary Jones makes a clearance. 50:59 Shot by Graeme Montgomery from outside the area goes high over the crossbar. 49:50 Corner taken left-footed by Thomas Kennedy from the right by-line, clearance by Abu Ogogo. 47:14 Inswinging corner taken from the right by-line by Graeme Montgomery, comfortable save by Frank Fielding. 45:21 Outswinging corner taken by Thomas Kennedy from the left by-line, Close range header by Craig Dawson misses to the right of the target. 45:00+1:36 The referee blows for half time. 45:00+0:11 Thomas Kennedy takes the direct free kick. 45:00+0:11 Booking Peter Gain goes into the book. 44:54 Danny Green gives away a free kick for an unfair challenge on Gary Jones. 44:02 Inswinging corner taken left-footed by Graeme Montgomery from the right by-line to the near post, Danny Green challenges Scott Wiseman unfairly and gives away a free kick. Frank Fielding takes the direct free kick. 43:30 Danny Green takes the inswinging corner, Craig Dawson makes a clearance. 42:38 Outswinging corner taken from the left by-line by Thomas Kennedy, clearance by Scott Doe. 42:00 Gary Jones takes a shot. Tony Roberts gets a block in. 41:02 Corner taken by Thomas Kennedy from the left by-line to the near post. 40:40 Temitope Obadeyi takes a shot. Clearance made by Scott Doe. 39:18 The referee blows for offside. Free kick taken by Tony Roberts. 38:07 Gary Jones takes a shot. Scott Doe manages to make a clearance. 36:09 Free kick awarded for a foul by Chris Dagnall on Scott Doe. Tony Roberts takes the free kick. 34:08 Danny Green takes a shot. Save made by Frank Fielding. 33:04 The ball is sent over by Jason Taylor, Headed effort from inside the area by Chris Dagnall misses to the left of the target. 31:23 Outswinging corner taken right-footed by Danny Green, save by Frank Fielding. 31:03 Damien McCrory takes a shot. Jason Taylor gets a block in. 30:32 Inswinging corner taken right-footed by Danny Green from the left by-line to the near post, Gary Jones manages to make a clearance. 29:13 Corner taken by Thomas Kennedy. 27:59 Chris O'Grady challenges Marlon Pack unfairly and gives away a free kick. Direct free kick taken by Tony Roberts. 27:48 The assistant referee flags for offside against Jon Nurse. Direct free kick taken by Frank Fielding. 26:31 Effort on goal by Chris Dagnall from just inside the penalty area goes harmlessly over the target. 25:21 Centre by Jon Nurse. 22:10 Shot by Marlon Pack from deep inside the penalty area misses to the right of the target. 21:36 Josh Scott produces a headed effort from deep inside the six-yard box which goes wide of the right-hand upright. 19:41 The assistant referee signals for offside against Chris Dagnall. Tony Roberts takes the direct free kick. 18:02 Corner taken by Damien McCrory from the right by-line played to the near post. 16:49 Centre by Danny Green, Josh Scott takes a shot. Save by Frank Fielding. 15:49 Danny Green crosses the ball, blocked by Frank Fielding. 14:54 Will Atkinson concedes a free kick for a foul on Danny Green. Tony Roberts restarts play with the free kick. 14:41 Graeme Montgomery crosses the ball, Nathan Stanton makes a clearance. 13:08 Jason Taylor takes a shot. 12:07 Abu Ogogo gives away a free kick for an unfair challenge on Chris Dagnall. Direct free kick taken by Frank Fielding. 10:42 The official flags Jon Nurse offside. Frank Fielding takes the free kick. 9:48 Jon Nurse provided the assist for the goal. 9:48 GOAL - Josh Scott:Rochdale 1 - 1 Dag & Red Josh Scott finds the back of the net with a goal from close range to the bottom left corner of the goal. Rochdale 1-1 Dag & Red. 9:04 Graeme Montgomery fouled by Temitope Obadeyi, the ref awards a free kick. Free kick crossed right-footed by Danny Green. 8:01 Assist on the goal came from Gary Jones. 8:01 GOAL - Temitope Obadeyi:Rochdale 1 - 0 Dag & Red Temitope Obadeyi scores a goal from inside the penalty area to the bottom right corner of the goal. 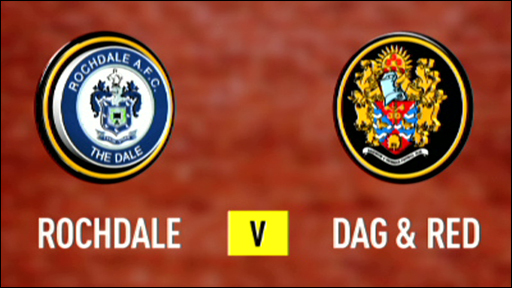 Rochdale 1-0 Dag & Red. 7:04 Free kick awarded for an unfair challenge on Chris O'Grady by Peter Gain. Direct free kick taken by Frank Fielding. 5:47 The assistant referee signals for offside against Josh Scott. Direct free kick taken by Frank Fielding. 4:54 Temitope Obadeyi is flagged offside by the assistant referee. Tony Roberts takes the free kick. 3:23 Abu Ogogo fouled by Chris O'Grady, the ref awards a free kick. Tony Roberts restarts play with the free kick.